The Vespa World Days is an annual and unique event for scooter lovers that takes place in a different country each year (next year is Hungary). 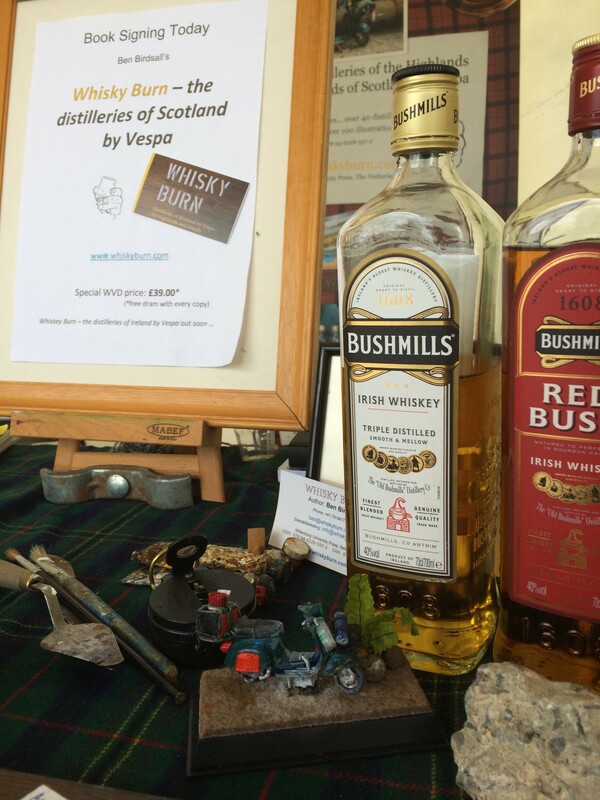 This event was hosted last weekend in Belfast, with a “Vespa Village” especially constructed in the actual dockyard where the Titanic was built and launched, now in the shadow of the city’s iconic Titanic Museum. People came on their Vespas from all over Europe – Holland, Germany, Portugal, etc., even Russia. Ben didn't take his own Vespa to the event: "It would have taken me over three weeks just to get there on my 50, so I took the plane this time instead", he says. 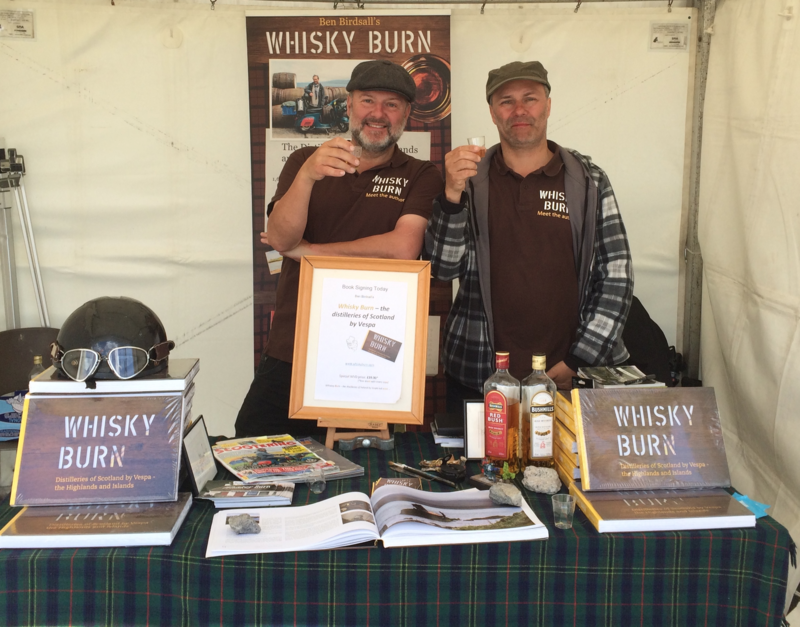 His big brother Tim, who lives in Ireland, came along to help out on the stall, and they passed the weekend selling and promoting Ben's first book on Whisky – Whisky Burn: Distilleries of Scotland by Vespa, published by Wittenborg University Press (WUP) in 2015. "Whisky Burn" details the author’s trip around Scotland, visiting over 40 distilleries and learning about the industry – all on a 1979 classic Vespa 50! Events like this are important to authors, Ben told us, it lets us meet the people who read what we write. And this time there was a special offer: a free dram of whiskey with every copy sold! After the success from sales and media attention of Whisky Burn, Ben has decided to give it another go – this time with Irish Whiskey, an industry with a remarkable sales increase – over 10% in 2017. He spent 3 weeks last summer on a tour of the Irish distilleries for his forthcoming book – Whiskey Burn: The Distilleries of Ireland by Vespa 50 – note the 'e' in Irish whiskey – to be launched in Dublin in November this year. 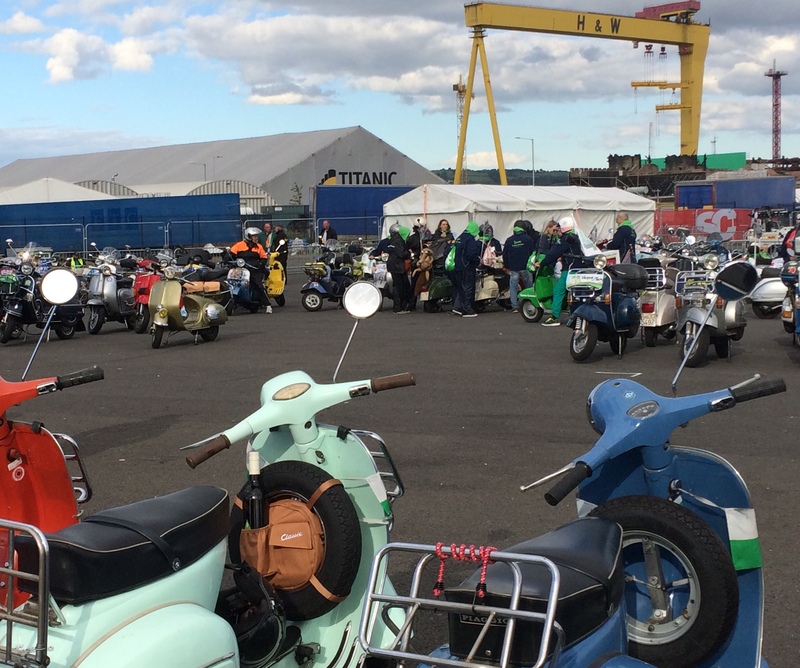 According to Ben, “The Vespa atmosphere in Belfast was buzzing – literally! There were Vespas all over town, Vespa-themed windows at local shops and businesses, and the unmistakable ‘pop-pop’ of the engine filled the air – we invaded the city!” Scooter lovers, 3,000+ of them, came from far and wide, from 39 countries, with their Vespas parked up in lines, wandering around to look at other people’s Vespas, then riding out to places like local museums, a castle and a Belfast prison that is planning to use one disused wing to build a new distillery! Aside from all that, Ben was invited to speak on Belfast89FM, a radio station that broadcasts songs from the 60s and 70s, fitting in well with the classic Vespa epoch. For the occasion, he brought along a sample of one of the oldest Irish whiskeys anyone has ever tasted – a 38-year-old Bushmills single malt – to taste with DJ Andrew McBride. McBride, a whiskey fan himself, played a fitting range of songs including, of course, “There's Whiskey in the Jar”! According to Ben, “That Bushmills was a sublime whiskey, the nectar of the Celtic gods!” But, alas, the listeners could only imagine.